I just wanted to email to thank you so much everything you did on Sunday. We had a great party and the food was excellent. Thank you so much again and I will definitely be in touch if Richard has a similar party next year. 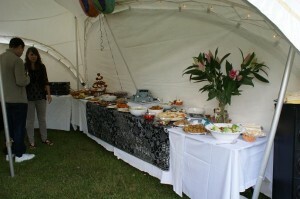 Contact Parkers now on 07940364028 for more information on our outside catering service. Backed up by Jenny Johnson Catering we can offer a fantastic service with a diverse menu capability Parker’s will be able to surpass your every expectation. Boasting a line up that includes a top chefs and a waitress service with lots of experience you know you can have confidence with Parker’s outside catering. We specialise in bespoke functions such as weddings and parties and are equally at home providing catering for corporate events with a number of very prestigious and successful commissions to date. Parker’s outside catering travel to all areas in East Anglia and are also happy to travel beyond to provide catering in other parts of the country. With the hog roast and BBQ’s we have the capability to feed 400 people with our trained staff and multiple machines. We have had some wonderful corporate events including Grove House Care Home, where we annually feed 150 hungry people and utilised our dual gazebo setup with a hog roast and commercial BBQ machine running side by side. We are adept at catering for vegetarians too and take this very seriously so we always use two separate machines one for vegetarian catering and one for hog roasts and BBQ. Our outside catering business also provides specialist catering for clients and customers above and beyond just the main course hog roast and BBQ and can do everything to make your event unique and stand out from the rest. If you would like to know more about Parker’s outside catering services then please contact us by phone or by email and we will be delighted to answer questions and give quotes.